George Washington saved his neck, Joseph Brant watched his back -- The view from the other side in the American Revolution. IF PONIES RODE MEN is the harrowing true story of Loyalist Robert Land set against the blood and smoke of America's first civil war. It chronicles the real-life adventures and adversities of Land as a British spy, backwoods recruiter and comrade-in-arms to the legendary Mohawk war chief, Joseph Brant. Burned out of his Pennsylvania homestead and sentenced to death for treason, he was spared the gallows by a judicious George Washington. One son was hanged by Patriots, one son died in the squalor of wartime New York City and one son fought alongside American turncoat Benedict Arnold. And behind the whole family stood Land's wife, the courageous Phoebe who kept her family together through all the dark days of privation and heartbreak. At the end of the war the family was reunited and became the founding first family of the city of Hamilton, Ontario. Drawing on extensive research of the historical record and sound understanding of the times, author and historian James Elliott has taken a Hamilton legend and rendered it believably whole in a work of imagination and scholarship that has been praised by novelists and historians alike. 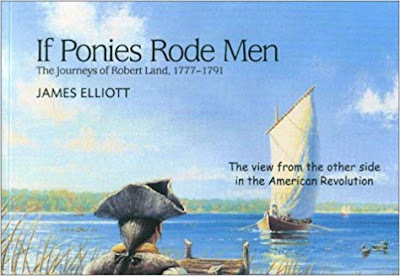 IF PONIES RODE MEN is a story of war and refuge, the view from the other side in the American Revolution where loyalty to the King exacted a steep price in blood, cost thousands their birthright as citizens and spawned the beginning of a new northern nation. Canadian James Elliott is an award-winning journalist, historian and author. He worked on several episodes of the acclaimed CBC television series, Canada: A People's History as a consultant and re-enactor as well as Brian McKenna's documentaries, 1812 and Chiefs and the A&E feature The Crossing. He lives in Hamilton, Ontario where he is the heritage writer for the Hamilton Spectator. Being a Hamiltonian, and seeing Robert Land's name all across my hometown, I always wondered who he was. Now I know. He was an American Loyalist spy, and for some reason he decided to make Hamilton his home after the revolution. Not without much strife, trials and heartache. He lost children. His family that survived was not with him for so much of his life. His story is sad. As a Canadian, it's weird to say my hometown is started by an American who was considered a traitor. But the British roots in me are quite okay with it all again. Still, I now know where my city started. The writing is slightly boring and fell flat for me, but I appreciate the research that went into this book. Readers will enjoy it's non-fiction with fiction. **This book was a gift. Opinions are owned by Fred'a Voice. It's always interesting to learn about our local history. I ghost-wrote a book that was about Hamilton, and a town that at first bore his name, then changed it for practical reasons. I've always wondered if the Canadian Hamilton was also named after him. You now have me intrigued to learn more as well. Thanks for sharing your review and your recent visit. I hope life is treating you well, my friend. I can't beleive the holidays are here so soon. Have a blessed Christmas season! Happy Christmas to you as well! !